There are plenty of fountains out there to make sure that your pet gets fresh water when the need it. However, most of them stay on all of the time, which isn’t necessarily bad if you enjoy the relaxing sound of running water. However, if you’d like to control how much water goes through the fountain you may want to try one of these Doggie Fountains instead. It doesn’t offer constant water flow, it only gives water when the pet activates it. You just attach this to your current garden hose and you can adjust the water height by messing with the amount of water pressure. 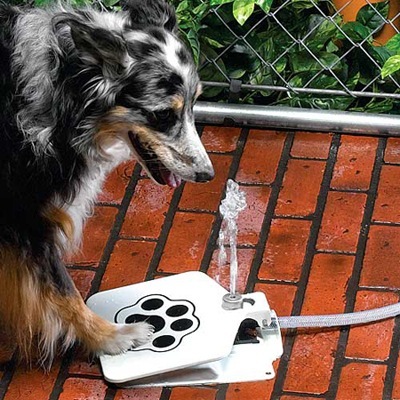 This would be a great way for dogs to get cool water even when it’s incredibly hot outside. You’ll also not have to worry about constantly refilling water bowls. The fountain will come on as soon as your pet steps onto the metal plate. You can purchase the Doggie Fountain for $39.98 through Taylor Gifts. Not sure if this is mentioned anywhere but PLEASE make sure that your ‘current garden hose’ is LEAD-FREE (marine/RV)!! !